The Asia Cup commenced yesterday (15th September) with Bangladesh's victory over Sri Lanka and will now see one of the hot favourites, Pakistan lock horns with Hong Kong. Though there are other fixtures like Afghanistan vs Bangladesh and Sri Lanka vs Afghanistan to look forward to, no match would garner as much interest as the India vs Pakistan one. The last time these two teams met was in the final of Champions Trophy last year in England. Then, Pakistan had defeated India by a huge margin of 180 runs and would be full of confidence when they meet their arch-rivals on 19th September. While India just recently suffered a drubbing at the hands of England in both the ODI and Test series, Pakistan won a tri-nation T20 series which had Australia and Zimbabwe as the other two teams and a 5-0 win in an ODI series against the latter. On that note, let's take a look at the possible reasons why Pakistan will go in as favourites against India. Pakistan have come into the tournament with as many as six fast bowlers - Faheem Ashraf (ODI bowling avg: 20.31), Hasan Ali (ODI bowling avg: 20.88), Junaid Khan (ODI bowling avg: 28.21), Mohammad Amir (ODI bowling avg: 29.75), Shaheen Afridi (yet to play an ODI) and Usman Khan (ODI bowling avg: 11.4). Though there's a certain lack of experience in this list, many believe this to be one of the best pace attacks in the world. India's captain, Rohit Sharma's record against Pakistan's premier fast bowler doesn't make for a good reading as well. Amir boasts of an astonishing average of 6.33 against Rohit - the opener has been dismissed thrice by Amir, once in ODIs and twice in T20s, and has scored only 19 runs in 49 balls against the pacer. 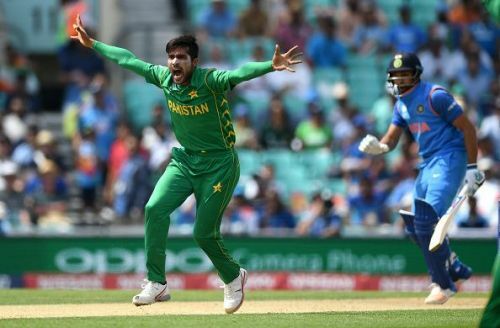 With India's longstanding issues against left-arm pacers, if Amir and Usman Khan manage to get through the Indian top-order, the MS Dhoni-led middle order could find it hard to get the innings back on track against the likes of Shadab Khan in spinning conditions.